The government has begun its sell-off of shares in part-nationalised lender Royal Bank of Scotland, raising £2.1bn, a third below the price it paid. It sold a 5.4% stake at 330p a share, a 7.6p discount on Monday's closing price. Chancellor George Osborne is facing criticism for selling the shares at well below the price of about 500p the then Labour government paid for them. The 170p difference represents a loss of about £1.07bn on the shares sold. The government's sale cuts the government's stake in RBS to 73%. RBS shares closed on Tuesday at 339p, up 1.4p, or 0.4%, valuing the bank at £39.2bn. 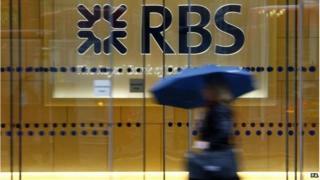 The UK bailed out RBS in 2008 and 2009 by buying shares for £45bn and supplying it with cheap funds. Ian Gordon, a banking analyst at Investec, told the BBC's Today programme: "The taxpayer is being short-changed." The shares could have been sold for a higher price in February, when they were changing hands for more than 400p, he said. However, James Bevan, chief investment officer at money manager CCLA Investment Management, said the loss was "relatively small". The point of the UK's rescue of the bank was to prevent further damage to the economy, rather than to turn a profit on the shares, he told BBC Radio 5 live. RBS chief executive Ross McEwan said: "I'm pleased the government has started to sell down its stake. "It's an important moment and reflects the progress we are making to become a stronger, simpler and fairer bank. There is more work to be done but we're determined to build a bank the country can be proud of." RBS reported a half-year loss of £153m last week after setting aside more money for repaying customers and potential legal settlements. However, for the three months to the end of June, the bank posted a profit of £293m. Harriett Baldwin, Economic Secretary to the Treasury, said Mr Osborne was following Bank of England Governor Mark Carney's advice that a sale should now commence. Mr Carney said in June the phased sell-off "would promote financial stability" and benefit the wider economy. As governor, Mr Carney is also chairman of the board of the Financial Policy Committee, which is tasked with protecting the stability of the financial system. UK Financial Investments (UKFI), the company through which the Treasury owns shares in banks like RBS, "has taken the view that there is a window of opportunity to start this process," she told the Today programme. UKFI owns the UK's stakes in Lloyds Banking Group, RBS, and the remains of the fully-nationalised lenders; Bradford & Bingley and the more-toxic parts of Northern Rock. It is run by a board who manage the investments "commercially" and report to Mr Osborne as chancellor. But Barbara Keeley, the shadow treasury minister, accused the government of "casually" losing £1bn. "The most important question for the tax-payer - are we getting good value for our money? This used to be something the chancellor used to care about, he said he would only sell these RBS shares when we get good value - clearly that's not now," she told Today. The question on everyone's lips is whether the taxpayer will get value for money from its investment in RBS. The complexity of the investment, and the chaotic time during which the UK bailed out the bank, means you can choose any answer you wish. UK Financial Investments argues that fees the government charged RBS mean that the break-even price is 441 pence per share. And the government could very well sell further batches of shares at a value closer to that amount. But that 441 pence price ignores the interest the Treasury would have had to pay to borrow the £45bn to buy the shares. Interest it has been paying for more than five years while no dividend has been paid by the bank in return. It also ignores the value of cheap money offered to the banks, including RBS, in the wake of the crisis. Finally, the reason the shares were bought in the first place must be remembered: to keep the doors of one of the world's largest banks open. Nobody can say how much would have been lost if the company had been put to the wall. RBS sale: Value for money? Fraser: What shape is RBS in?